Investing in a retractable commercial canopy or awning is a powerful way to improve your branding, guest comfort, and energy efficiency. High-quality products can expand your usable space, increase your foot traffic, and update your building’s style – helping you save (and make!) more money. 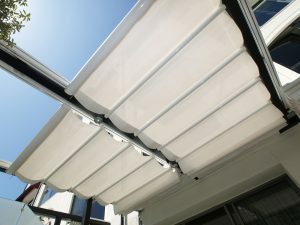 However, not all canopies and awnings are created equal. When purchasing a retractable commercial canopy or awning, it’s important to consider these three questions – to ensure the product you’re getting will add value to your property and not detract from it. Is the Product Durable and Easy to Maintain? A well-made retractable commercial canopy will last year after year and require minimal resources to maintain it. Poorly made versions can leave you wondering why you made the investment in the first place. At Retractable Structures, we guide our clients through our professional design-build-installation process to ensure the products are expertly crafted to withstand time and regular use. Is the Commercial Canopy Right for My Property? There is not a one-size-fits-all option for a commercial canopy. It needs to address the unique needs of your property. Before you can choose the commercial canopy that’s right for you, you need to identify the challenges you’re looking to address. At Retractable Structures, we offer a wide range of motorized and manual commercial-grade products, including Slide on Track, Slide on Wire, Lateral Arm, Retractable Tension Shades, and Retractable Vertical Screens. Whether you’re looking to cover a large patio or overhead skylights, we’ll help you choose the best product for your needs. Where are the Retractable Commercial Canopies Manufactured? In today’s global economy, many products are manufactured overseas, which often results in reduced quality or inaccurate product details. Retractable Structures is a division of Eide Industries – a US-based specialty design-build manufacturer. We engineer and manufacture our products in our 41,000 square foot Southern California facility. This gives us ultimate control over quality and project specifications, so each of our clients can depend on the superior craftsmanship and professional customer service for which we’ve become so well known. Is a Retractable Commercial Canopy Right for Your Property?